Home › - Nation › The Health Transformation Plan – what is it exactly? The Health Transformation Plan – what is it exactly? “There are four core aspects to the Malaysian Health Transformation Plan. First, to strengthen basic health care and promote a healthy lifestyle. “Second, to improve the services and management system; third, to develop a human resource master plan to enhance the skills of doctors and ensure there are enough doctors nationwide,” he told a press conference here Wednesday. The fourth aspect involves implementing an infrastructure master plan for facilities in hospitals including adding 15,000 beds in government and private hospitals nationwide, he said. I don’t know about you but it doesn’t seem like anything different to the current setup with incremental changes to try to improve and strengthen the public healthcare facilities which are already creaking under the strain of too few beds for too many patients. With the ballooning of healthcare costs, we wonder where the funding will come from? There are already cost cutting measures being put in place by Putrajaya. 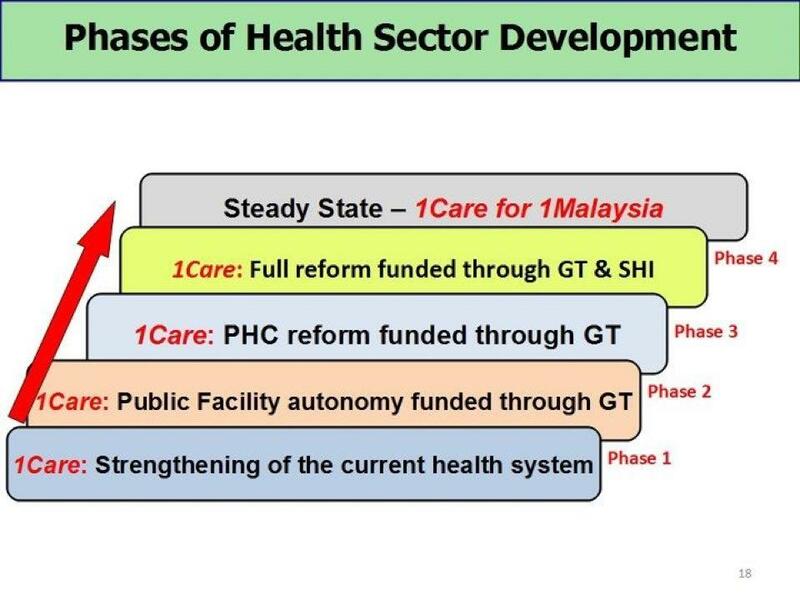 We do hope leakages will be plugged but there are things not mentioned like the “National Healthcare Financing System” (or SHI in phase 4 in the picture below) and we remain in the dark. This slide presentation shows you the 1Care proposal and we wonder how much of this will carry forward into the Healthcare Transformation Plan announced by the Minister. Rather than vague press statements I think we need concrete information and greater transparency. The future of healthcare of the nation is at stake here.